My friend & I enjoyed our July Greece trip tremendously, thanks to your good coordination. We had a bonus on our last night in Athens as we were given the best view from the hotel of the Acropolis by night! We will definitely call on Dolphin Hellas to arrange our future Grecian holidays. Season's greetings and have a bountiful year ahead! We would like to sincerely thank you for helping organise a lovely holiday for us. We really enjoyed our trip to Greece. The mainland tour was really great and I have recommended that to all my friends who wish to visit Greece in the near future. We are also very pleased with your effort to meet all our requirements and admire the flexibility that you have exhibited in trying to accommodate some of our request, particularly that on the Meteora. Thankfully, my daughter did show a fair amount of spirit to scale the heights, both at Delphi and Meteora. At the end, although it was tiring for her, she enjoyed the tour very much. She also enjoyed the one day cruise. Once again, thanks a lot for all the help. This is just a note to say THANK YOU for all your assistance in planing our trip to Greece. We had a GREAT time! The trip was beautiful! All the ferryboats, hotels and transfers were on time and reliable as scheduled. We loved the trip and we really appreciated the assurance of your services. I've been meaning to e-mail you and tell you how our vacation went, but have been putting it off - no excuse, I apologize. Anyway, we all returned home safely after a great vacation. The arrangements you made for us all worked out very well, and we'd be happy to provide a testimonial to your excellent services. The best part of our vacation was meeting and getting to know the Greek people. We had wonderful experiences in this respect every day. All of the people involved in the arrangements you made for us - at the hotels, the car rental agents, travel agents, etc., were great. In particular we appreciated your agent in Mykonos (whose name I've forgotten) and Santorini (Efi), and Vladimiros, the car rental agent in Naxos. The next best part was the food - we ate a lot! This includes the ouzo which we also enjoyed. It is too bad that we can't find good ouzo in the U.S., most stores only stock Metaxa. We can't find Ouzo Mini or D'Artemis. The hotels were great, especially the Porto in Hania and the Neoklassico in Santorini. The cars were not up to American car rental standards (we are used to big, new, clean rental cars), but this is a very small complaint. Two of the three were quite dirty when we got them, and one had a nearly shot transmission. I should have arranged for one size bigger cars - the Fiat Punto in Naxos was too small to haul all of us and all of our bags, but Vladimiros kindly helped us haul our luggage to and from the ferry to the hotel, so it all worked out. So, we hope we can visit Greece again someday, and if we do, we would certainly again retain Dolphin Hellas and ask for you! Nous voici déjà de retour de notre voyage en Crète. Effectivement, il a fait beau et chaud, il paraît même qu'il va faire jusqu'à 35 degrés demain! Tout s'est très bien passé. Nous avons pu visiter Knossos mardi après-midi et nous avons ajouté un petit tour dans l'intérieur du pays, vers Archanès et Trapsanos, des villages très sympathiques où nous avons pu voir travailler des potiers, notamment. La mer était encore très agréable et nous nous sommes baignés à Vaï et à Matala. Delphine a joué les dauphins sur mes épaules! Toutes les réservations ont fonctionné de manière parfaite. L'hôtel Atlantis, que nous connaissions déjà est vraiment à la hauteur et son personnel très agréable. Merci pour vos services, et rendez-vous pour un prochain voyage. J'aimerais beaucoup faire découvrir le continent grec à mon mari qui n'est jamais venu, mais nous manquons surtout de temps. De plus, en 2004, avec les jeux olympiques, j'imagine que ce ne sera pas le bon moment pour visiter dans le calme. A long overdue note to tell you how much Pat and I enjoyed our trip in August to Athens, Santorini, and Paros. Our accommodations, transportation, and all of your recommendations were "right on" and made for the best vacation that we've ever taken! Santorini, and, of course the Astra, were magical. But, let me put in a good word for Paros as well -- where we'd definitely return. I can't say enough about the Hotel Contaratos. Wonderful people, a terrific location (you could walk to town) and a marvelous beach and pool. Thanks to you, they also gave us what I think was the best room in the house!!! We also took a nice day trip to Delos (Wow) and Mykonos (too many tourists), which I'd recommend as well. Your choice of hotel in Athens also was terrific. To lay in bed at night and see the Parthenon is a once in a lifetime experience. Needless to say, we can't wait to go back and try some new islands and see some new sights. We probably won't tangle with the Olympics next year, but after that, who knows? Please keep us abreast of any specials that you are offering. Also, let us know if you arrange for travel in other parts of the Mediterranean. Again, many thanks for your good guidance and help (including locating our luggage!) You have a wonderful country, and your assistance allowed us to enjoy it all the more during our much too short stay. Carla and I had a wonderful time in Greece! Thank you so much for making the travel arrangements so easy. You and your staff at Dolphin Hellas are to be commended! The people we met and the memories we made will be with us for a lifetime! You have a beautiful country and we hope to see it again in the future! My friends and I thoroughly enjoyed our trip to Athens and Santorini. Thank you so much for the arrangements. Everything turned out the way one hopes for on holidays - very well arranged. We enjoyed the people we met, the places we visited and the hotel, Athens Cypria, is located centrally. I just wished our rooms on the 5th floor afforded views of the Acropolis. We especially appreciated the private transfer arrangements when the taxi drivers went on strike the days we returned to Athens from Santorini and were leaving Athens for home. Thank you once again. I would recommend Dolphin Hellas to friends going to Greece for holidays. May I express my warmest thanks to you for the perfect arrangements for the Finnish winery group. They informed they were very happy with the nice hotel, all arrangements went smoothly and the wineries were very hospitable, all sights were interesting and best of all the guide, Maarit , was very nice with good knowledge of everything. Please forward sincere thanks to Maarit as well. Hope to turn to again with new groups. Well,I cant believe the trip is over for the year and I can start thinking about the next one....in the Spring this time. I think I will head up north to the lakes for a week or so and then its to a place or an island I have yet to visit. I want to thank you for all the work you invest in making sure my trips are enjoyable and for understanding the times that I have changed for one reason or another the existing itinerary. Sometimes it is hard to explain a feeling; an instinct or an intuition about a place when sometimes you are not sure of it yourself. I really enjoyed the restaurant .....while the food was excellent, the view was picture postcard perfect. It made a great finale to the trip and I thank you. best holiday ever as we celebrated our 31st wedding anniversary. I am so glad that we had you to assist us in making the arrangements. It really was a pleasure to work with you! We arrived Santorini late in the evening after travelling for a day and a half. The staff at Chromata welcomed us warmly, and soon we were in our quarters. We accommodation was as you had said it would be - we were delighted beyond words with the arrangements. We did not wake up until just after 1 o'clock in the afternoon of the next day. You can imagine the stunning view that greeted us as we wandered out of our room to the sun drenched terrace overlooking the caldera. I was speechless, and stopped breathing as I tried to absorb the view. My wife could hardly speak, but when she did, the only words she whispered were, "This is my dream." I will always cherish that moment. My emotions well up every time I recall it. We walked from Imerovigli to Fira every day, took a tour to Akrotiri, walked on Nea Kameni, visited Therasia, walked the streets of Oia and stayed for the sunset, and even managed to get to Perissa for a day. We ate in a different restaurant every evening and were never disappointed. The food was memorable whether the establishment was modest or grand. Needless to say, we both have fallen in love with the island, and the people. And speaking of love, we made love every day. She said that there is just something about the place that wraps you in a magic feeling of romance. I happily agree: Santorini is a very special place. When we left a week later, we both agreed that we will be coming back to Santorini, and probably for a longer visit. Though I see people saying 3 days is enough, we could be content in Santorini for 2-3-4 weeks, no problem at all! We arrived in Rhodes and did not receive as warm a reception either at the airport or at the hotel Ibiscus. The hotel room was on the first floor, faced the street, was very noisy, and had a grubby feel (the carpets, furniture, and bathroom were not very well maintained). I asked the night manager to move us, as we were supposed to face the seafront or have a gardenview, and this was neither. He was unmoved, and said we would have to wait until the morning. I considered getting in touch with you, but wanted to first see if we could resolve the problem ourselves. By the time I got back upstairs, the air conditioner had sprung a leak, and was steadily dripping water on the carpet! Now, I insisted and we received a temporary room change for the night. The next morning after breakfast, the day manager had us moved to a room on the third floor. Though it still was on the same side of the building (the "windy" side), and did not have either of the views we expected, it was a newer room, clean and, because we were higher up and further away from the street, a bit quieter. Rhodes is of course a completely different experience than Santorini. Being urban and larger, it gave us a look at a faster pace. Rhodes Old Town was our focal point, where we went each day to explore the area, do some shopping, and eat in the restaurants and cafes. I have a big interest in the Knights Templar, and found the Old Town and the fortifications an opportunity to see an important historic location associated with the Knights. It is a truly impressive city. We managed a day trip by bus to Lindos,and were very impressed with the site. The beaches along the way looked very nice, and I made a note that we should try to sample beaches like those at a future time. Elli beach was right across the street from the hotel, and we spent two days just lazing about under umbrellas and swimming. I was amazed by the water both at Santorini and Rhodes Town - there really is a colour "Aegean blue" and it is now my favourite! The water was so crystal clear that I could look down and see my toes, and beyond them to the bottom perhaps another 2 to 3 meters below. This was true at Perissa, at the hot springs behind Nea Kameni, and at Elli beach - fabulous! Rhodes was a place we wanted to visit, and enjoyed our time there. But next time, we will be seeking the slower quieter pace of Santorini and similar islands. Perhaps Naxos, Paros? I don't know yet. But we will be going back to Santorini. We left Greece and flew to London where we spent the evening at Mon Plaisir - a restaurant that has a lot of memories for us. So it is possible to be romantic even in London! The next day we went to Kew Gardens for the day with some very good friends who toured us through and gave us an education on flowers and plants. Anyway, I need to thank you again for giving us such marvellous accommodation at Chromata. It did indeed exceed our expectations, and we spoke your name with gratitude on more than one occasion while there. Chromata is a fine place to stay: the staff were outstanding in every way. The pool is unique and delightful. The breakfasts were excellent. But I think the location is one of the very best for viewing the caldera. We took a look at accommodations at Sun Rocks, and visited Sunny Villas, as well as Astra Apartments. Frankly, Chromata is much more welcoming, has fewer stairs to navigate, has a better view, and overall is probably a better value. Needless to say, we had a glorious time, and took advantage of every single moment. It was also a great comfort knowing that if we did have a problem, you would be there to help us. So, we just wanted you to know that we loved the trip, and thank you very much for being so helpful and generous to us. You are truly a treasure! I look forward to working with you again as we plan our next trip to Greece. Thank you very much for taking care of the hotel business in Nafplio. Our trip came to a happy end without much more troubles except that in Delphi we almost missed the last bus to Athens because the hotel was locked for siesta when we came to pick up our luggage - however we made it on time thanks to efforts of a kind neigbour who awoke the guy by throwing little rocks in his window. I guess it was a cultural misjudgment on our side - we should have specified with the hotel the time when we wanted to pick up our bags. We appreciate your help very much. I gave a reference to a colleague of mine who is thinking about getting married in Greece. Hopefully, we will also be back after the Olympics to visit the famous archaeological museum and more islands. I got back from Greece yesterday and wanted to thank you for your assistance in booking our hotel and car. Everything went very smoothly which was very much appreciated. The Fortezza was the ideal hotel and we got a room exactly as we wanted: facing the pool, with a balcony and on the top floor. The service from the car rental company was terrific -- the representative was waiting for us at the airport when we arrived and it took no time to fill out the contract. Plus the jeep was in perfect condition and we had no problems with it. Thank you again for your help and best wishes for a wonderful fall. Charles and I are back from our wonderful vacation in Greece. We enjoyed it so much, and we have you and your wonderful team there at Dolphin Hellas to thank... everything went so much more smoothly than it would have if we had tried to do everything ourselves! Every time we got off of a ferry and saw someone holding up a sign that said "TURNER" we were so grateful not to have to worry about what to do or where to go. I just wanted to give you a little bit of feedback on the different islands we visited, the travel contacts and the accommodations, that you can use for future reference. Paros: The CONTORADOS BEACH hotel was very nice, the room was fairly spacious and clean, but the room we were given was very dark, even with the windows and curtains opened. The staff there was helpful, but not terribly friendly. The location was good, although in the future we might choose to stay at the other Contaratos property, since it is just a little closer to Naoussa. All in all, this was a perfectly acceptable accommodation. Orbit Travel, Paros: Corinne, our travel contact there, was the most helpful of all three of the travel agents we dealt with on our trip. In addition to meeting us at the ferry, she came out to our hotel to sit down with us and give us information about the island, excursions, car rentals, etc. It was nice to receive that much personal attention. Naxos: The ALKYONI BEACH hotel in Naxos town was also very nice, with a very friendly and helpful staff. The rooms were very spacious, and we really liked having a separate sitting area from the bedroom. While it would have been nice to be on the beach, it was still a very convenient location and we enjoyed our stay there. I particularly enjoyed the taverna where breakfast was served. 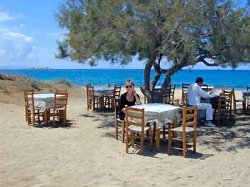 Orbit Travel, Naxos: Our contact, Michaela, met us at the ferry and got us to our taxi, but we never really heard from her again. Fortunately, we didn't have any problems, and I am sure she would have been able to help us if we had. 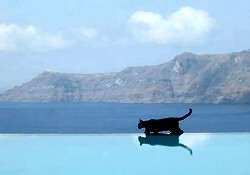 Santorini: The view from the GROTTOS VILLAS hotel was outstanding, we could not have asked for better. We had a lovely, large balcony, and our room had all the amenities we needed. However, this was probably our least favorite hotel (although the view certainly raised our opinion!). The reasons for this were the staff, which were unfriendly and not very helpful, and the bathroom smelled terrible. We believe there might have been a sewage problem, we are not sure. While it didn't ruin our stay by any means, it definitely made me wish we were staying in a different hotel. Travel agency, Santorini (I can't remember the name): Our agent, Luisa, was also quite helpful, and arranged for our car and an all-day boat excursion. She was easy to reach and we have no complaints. All in all, Uli, our trip was wonderful, and we couldn't be more pleased with the service we received from you and Dolphin Hellas. Please feel free to use any of this letter as a referral, if you need to. Also, let me know if you have any questions about my comments. I am writing to express my sincere thanks to your agency, and especially Esther, for making the travel arrangements in Greece. My husband and I just returned from a long trip in Europe, and spent one memorable week in Greece. We had a great time in Greece, and it would not be the same without Esther's help. When we first found Dolphin Hellas from Matt Barett's Greece Guide, we also checked with some other Greek travel agencies. Esther was the first to respond to our inquiries and presented us with the best travel options. So we decided to use Dolphin Hellas. Throughout the process, Esther was always very responsive to our requests. Even though we only had one week in Greece, we were going to several places such as Athens and the islands, so the itinerary was quite complicated. Esther demonstrated a lot of patience in working with us. As a result of her efforts, our trip in Greece was very smooth and we were very happy with the hotel, transfer, ferry and airline arrangements she had made for us. Because we left with such good memories of Greece, we plan to come back again in the future, and we will ask for Esther's help again when we return. In addition, we will also let our friends know about your services in the event that they are planning to travel to Greece. Having completed our 'grand tour', may we say 'Thanks' for the arrangements which you made for us. Everything worked smoothly, and we had no problems - Thank you for an excellent holiday! Just wanted to drop you a line to thank you for contributing to the success of our great holiday and let you know how much we enjoyed it. I really appreciated all of your help! I also wanted to compliment the gentleman from whom we rented the car in Rhodes. I don't recall his name, but he was incredible. Instead of just giving directions to the hotel from the airport, he drove all the way there so that we could follow him. I wonder if you could pass on our thanks to him. Also, we found the staff and facilities at the Tzekos in Santorini and the Rodos Park to be extraordinary. In fact, all of our hotels were quite nice. Again, thanks so much for the wonderful service and help in putting the terrific trip together. Dear Aliki, I wanted to write to thank you for arranging our honeymoon. We had a fantastic time. Everything was wonderful and we hope to visit again in the future. Thanks again for the magnificent accommodations and transfers. We were so impressed by how efficiently you were able to put our trip together. We had a blast! We have given your cards out. Our Metropolitan Methodios will most likely be calling you on Monday to assist him in booking some boats and maybe hotels. ... Also, a couple, John & Elaine ... may call you for a trip they're planning in September. I hope they do. ... Also, our men's group from our church wants to plan a tour to Greece. So when they do, we'll get in touch with you. Thanks again for everything. You're the best!! For months we had e-mailed between Norway and Athens about our planned family trip (six people) to Greece, me explaining our wishes, you trying to arrange everything accordingly in a sensible way. Our trip lasted 25 days and took us to Lesvos (Molyvos and Skala Eressos), Chios (Karfas), Syros (Megas Gialos and Hermoupolis) and Tinos before ending in Athens. It was wonderful. And everything sent to us from Dolphin Travels worked: the vouchers, the tickets and the hotels which you had suggested. And not only this feeling of security during the trip, knowing we had Dolphin Travels and its connections to back us, but twice you were able to change arrangements according to our wishes, with practically no extra costs. It was magnificent. You and Dolphin Travels most certainly played a major role in making our holiday in Greece a genuine success. For your never ending patience, constant friendliness, always quick to respond, always reliable, always accommodating, always sensible, we are truly grateful! We just came back from our trip to Greece and wanted to send a big thank you for helping us make this trip so wonderful. I wanted to especially mention your affiliate agency in Santorini, Bellonias Travel. Luisa from Bellonias was exceptional!! She went out of her way to help us make the most of our short time there. With only about 45 minutes of time, she helped us get a private mini-bus to see the sunset at Oia, recommended and reserved a table for us at a beautiful restaurant there (Paleo Orihia---wonderful place, owner Milton, food, and service! ), and had us call her 30 minutes before the end of our dinner so that she can get the mini-bus to come get us again. During our dinner time, she had already arranged the next day for us. We felt very much taken care of! I wanted to give you this feedback so that you know how much we enjoyed the incredible service of Luisa from Bellonias Travel. Again, thank you again for helping make our first trip to Greece a beautiful one. It won't be our last. We will definitely be recommending you and Luisa's agencies to our friends! Herewith we want to thank you for your help with our accommodation in Hotel Achilleas in Athens on the 8th and 17th July. We were very happy with the accomodation and we had a very nice stay in Athens. We did travel by bus A95 from and to the airport. It took us about one hour and in the early morning of 18th it was even less than an hour, so we got our flight on time. Thank you for your services and hopefully we will be able to go to Greece in the future again. Thank you for all of your organizing-our vacation was better than we dreamed it could be. Greece was such a fabulous place to relax, enjoy the wonderful food and the warm people. We can't wait to come back and we know we'll be calling you when we do! Thank you again for all of your help-you were professional from start to finish and we loved every moment of our vacation in Greece! A thousand thanks and our sincerest gratitude Uli! I am sure you always receive emails of thanks - dealing with you and Dolphin Hellas has been a pleasure. We are both very excited about our trip to Greece and we thank you for helping us. Esther, We had a terrific time in Greece. Santorini was awesome. We walked the 10k from Fira to Ia. Had a Greek salad every day, they were so good. at Nicois we had really good moussaka. We had good local wines at every meal. Also the Dubliner was a very good restaurant. Naxos was so different but still exciting. Rented a car a toured the island to see the beaches and small villages. Tdid not he village of Apiranthos with anti-American graffiti that had been there awhile did not makes us want to stick around. We did not fell welcome or comfortable to be there. Seems to me if tourism dollars are important to a community it would probably be best to remove it quickly regardless of how you feel about it. We spent time on some great beaches alone. Lodging was great and Nelda was so helpful and brought us a very good breakfast each morning . Dinner at Lucullus was so good we came back 2nd night. The whole staff treated us so well and the owner bought us a bottle of wine. Athens Plaka Hotel was really nice and great location to so many things. The afternoon/evening check in manager seemed to have a real attitude problem with Americans. We know he purposefully forgot our 5am wake up call. But mostly we were treated great everywhere we went. Esther, we tried to find you to come and visit you to thank you personally for your great recommendations. I think we were only 2 blocks from your work but it was raining pretty hard and needed to get back to our room. But thank you for an absolutely wonderful vacation! We had a wonderful trip. Our accommodations were excellent. Please feel free to use my name as a reference if you need to do so with any of your other customers. We hope to be using you again in the future. Keep our name in your data base and let us know if you have any travel specials. Thank you so much for all your wonderful help in making this trip happen. The entire trip went very well and we had the most wonderful time! We all fell in love with Greece and definitely plan to return to the islands again. Hi Uli, We are back from our vacation now and I wanted to write to thank you for all your hard work. The hotels you booked for us were wonderful and we had a GRAND time. I thought I would provide some feedback and suggestions for others you will serve in the future. If you book anyone on Olympia going into Naxos, tell them to be prepared to arrive without any checked luggage. The runway is very short in Naxos and it seems that Olympia has a weight issue if there is no head wind to land into. If there is no wind, Olympia takes all of the checked luggage down to the port and puts it on a ferry to arrive the next day. This happened on our flight and on the flight the next day also. The other note is about getting a taxi when arriving in Santorini by ferry. We were not one of the first to get off the ferry and there were no taxis left. They had all picked up preceding passengers and were disappearing up the cliff and did not return. We had to go over to an office and have them call for a taxi and it was an hour before we left the port. I would suggest that you recommend getting a reserved taxi for your clients. I was surprised by how literally the Hotel Sofitel was “right at the airport” as you had said. When Americans speak of a hotel “at the airport” they mean within 1 or 2 km from the terminal (a very short taxi ride). The Hotel Sofitel even has a rack for the baggage carts from the airport; you can get your baggage and walk 100 meters and you are at the hotel. Very convenient. Marandi Villas was wonderful. George and his staff could not have been friendlier. Naxos was lots of fun – beautiful beaches and the town was fun to wander through. We ate at PARADISO TAVERN a couple of times and loved it. Perivolas Villa was spectacular and again, the people were very very kind and helpful. Thanks for a great vacation, Uli. I want to thank you for excellent help during hour HD and FD tours, when we was i Athen 1. - 8. juni. Both the guide (Andreas) and the busdriver (Vasili) did a good job, and we are very happy with the service. We've been back ten days and everyone is unanimous in saying they would head right back to Greece on a moment's notice. Every one of the 65 people who came on the trip have said they had a wonderful time. Considering the odds that someone in 65 would be too sick or too lonely to appreciate even an excellent trip, we are feeling very grateful to have 100% satisfaction. Thank you so much for all you did to make our trip so smooth and comfortable. You are a wonderful combination of head and heart!!! I truly feel that most, if not all, of these students are returning better world citizens, aware that Greece has a delightful culture and place in world history that are deserving of respect and love. I thank you for your part in helping to open all our eyes to your great civilization. Just a short email to say thank you for the help with our coach tour - it was more successful than we even imagined! In particular our driver, Peter, performed superbly and we managed to meet our targets throughout the itinerary at a good steady pace. In fact on 2 days we actually added more to the day as things were going so well! We would like to repeat the tour next year and will be in touch as soon as we know dates, times etc. Here we are back from our trip. I surely did wanted to stay longer. I must say, that it was one of our best vacation ever. Specially Delphi and Santorini island. A week and half later I am still playing my CD of Yannis Parios and cooking the greek food. A kind of extension of our trip. Thank you again for all your help for our stay and travel. We shell return one of these days again. Christina, thank you for all of your help and guidance on our trip to Greece (Athens, Tinos, Naxos and Santorini). My husband and I had a fabulous time - an outstanding, unforgettable honeymoon. The hotels were great. The Hotel Adrian in Athens had an incredible location right in the Plaka, great service, and a great view of the Acropolis. The Tinos Beach Hotel was great; the bungalow section was very private. Chateau Zevgoli was outstanding; the local travel agent greeted us in our room after we arrived to offer her services and support. The Atlantis Villas was just fabulous - we were speechless when we saw it; the service was incredible. The business class seating on the ferries spoiled us. Our trip was perfect - thanks to you and your attention to all of the details. Please forward this message to your manager so that he or she can hear first hand how pleased we are with the service you provided to us. Just a quick note to say thank you very much for organizing the hotels and ferries for us on our trip to Athens and the Islands, last week. I will not hesitate to recommend you to my friends and family for any travel related bookings within Greece. Well returned from a very good tour - again - I would like to thank you for your help. It was nice to see you again. We had two very good excursions and - my compliments to Stephanos. He was very cooperative in any way. One of my boys had left his wallet in the coach the first day. We called him in, so he could keep the wallet to the next day, but he turned up at the hotel with the wallet the same evening. We was very much satisfied with his driving and cooperation. We returned to the hotel at 5.30 pm and 6.30 pm. So my best recommendation for Stephanos. We then went to Aigina thursday morning and relaxed. Four of my students took a tip-toe in the water. It was cold. And then we returned friday afternoon. Everyone was excited about visiting the old town and was very satisfied with the whole tour. Therefore: I thank you once again for all your help and hope you may enjoy your summer. uli, kurt and i just wanted to thank you for making the arrangements. we had a beautiful and memorable wedding and were very happy with everything. we had some bad luck with weather, but there is no way you could have guessed that. in any event, thank you and we look forward to a return trip soon. We have returned safely home and wanted to thank you for all your help in setting up the arrangements for our trip. Everything worked out beautifully! We loved your country and the Greek people we met.. The scenery and sites are magnificent. Each hotel was lovely in its own way. Just a minor suggestion--it would be helpful to send addresses and a little map, particularly for Napflion and Chania. Neither the Nafsimedon nor the Porto Del Colombo are on any of the tourist maps and we had a little bit of a hard time finding them, particularly in Chania. I will be happy to recommend you to anyone travelling in Greece. If you ever come to Philadelphia, please let us know. Back in the states with minimal incidence. Thanks once more for all your assistance in creating a very memorable experience for faculty and students like. We had a wonderful trip! One of our students left his camera on the return bus trip from the islands. Can you find out if it was turned in. I sincerely doubt he will get it back but it is worth a shot. Just thought I would send a quick note to thank you for your assistance in booking our holiday. We had a wonderful time and can't wait to come back again - maybe with our children this time! The Attalos was a really good friendly place that was well located. The Cronin was a dead loss - we took one look and decided to stay elsewhere straight away - so they got paid for nothing - it is more of a backpackers place - anyway I can't blame you _ I picked it - we stayed at the Olympia palace which was only about 23 or so euro more per night and was much nicer. IN retrospect we would not stay at Olympia in mid winter again as it was virtually closed down - especially at night. The Acronafplia was everything that you said it would be and we loved it - next time to stay in places all like that would be great. Telioni was also ok, but a local friend told us that it had a reputation for "lovers" - I think she mean that people having affairs went there a lot! They were very nice to us however and we were happy to find it by accident as we drove around the city!